Yarn Type 100% Wool made with high quality extra fine merino. Merino has a natural elastic quality allowing for movement when wearing. It is also ‘breathable’ so warm when the weather is cold, and cool when the weather is hot. The knitted fabric is soft and smooth and is a great core yarn with. Available in 4ply, perfect for babies and toddlers, DK and Aran. Machine wash 40 deg. 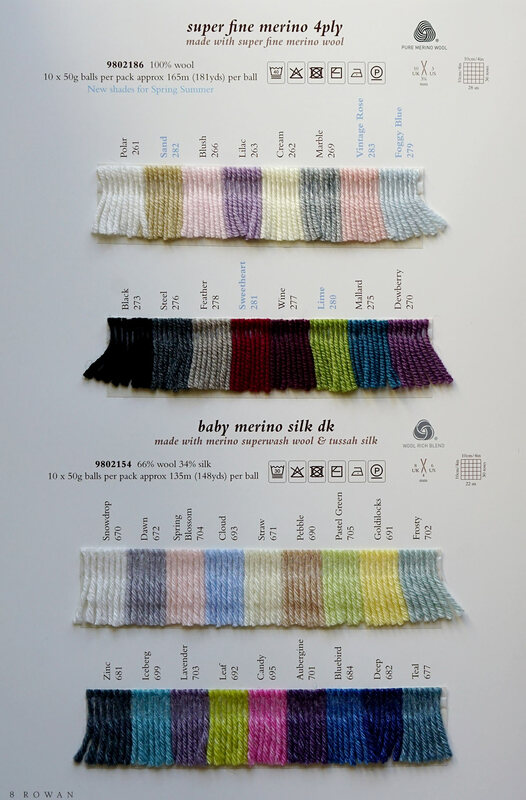 13 designs for babies and toddlers up to 3 years using Super Fine Merino 4ply Baby. Designed by Rowans in house design team.Inspired by simple garments with cute colour mixes and fun embellishments. Designed to be wearable for all babies up to 3 years, this collection is sure to be knitted from again and again, offering options for everyones little darlings.